Yes, yes, I know Easter is still a week away, but I've been looking forward to this lunch box for months, and besides, next week is Spring Break. 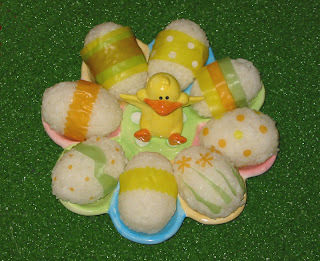 Anyway, maybe this advance posting will give some of you time to join me in making adorable Musubi Eggs this Easter! 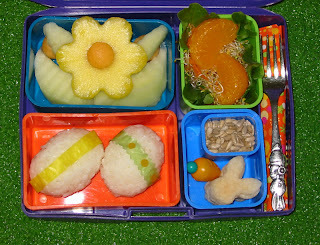 To make these eggless eggs I followed the recipe for Musubi in Vegan Lunch Box. (Also known as onigiri, musubi are Japanese sticky rice balls.) I pressed the sticky rice into a plastic Easter egg sprayed with nonstick spray to start forming the egg, then used my hands to solidify and finish the shaping. I pushed the filling in where an egg yolk would be. These are filled with cashew butter but tart, salty umeboshi plum is traditional. To decorate the eggs I used mamenori -- thin, vegetable-dyed sheets of edible soybean paper (please note that the pink sheets are colored with cochineal and are therefore not vegan). 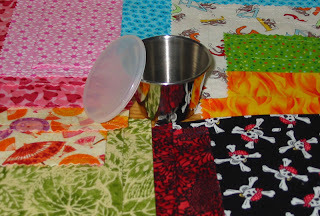 I cut the sheets with scissors, pinking sheers, and paper punches, then set them in place with a dab of water. The mamenori tended to curl when wet but wouldn't stick without a bit of water, which was a big pain. In the end, though, I was happy with our little eggs and loved the pastel colors. As you may have noticed if you followed the mamenori link above, these sheets cost a pretty penny, especially if you want to use an assortment of colors. I was lucky enough to work out a trade with Cooking Cute for a few sheets -- thanks, Ngoc! If mamenori is out of your price range, other options include using nori or dyeing the rice itself with natural food coloring. I even think those thin "fruit by the foot" fruit leathers I've seen at the grocery store would work. I was also inspired recently by the fruit-filled bouquets over at Edible Arrangements, and decided try my hand at making my own tiny arrangement for Easter. I cut out a pineapple flower with a cookie cutter, used an apple corer to remove the center, then wedged a cantaloupe ball in the middle and surrounded the flower with honeydew leaves. On the side is Sprout Salad with Mandarin Orange Dressing (also from Vegan Lunch Box). The dressing is hiding in a little plastic carrot down below, nestled next to a happy warren of jicama bunnies. A small container of sunflower seeds can be eaten as is or sprinkled on the sprouts. Verdict: The first thing shmoo said upon seeing this lunch? "Oooh, honeydew!" Yes, melon is exciting when it's out of season! The eggs were a hit, too. Shmoo was tickled that he could actually eat the colored paper. He loves squeezing his dressings out of all these little plastic squeeze bottles, but still doesn't seem too keen on actually eating his salads. 5 stars. Happy Easter! 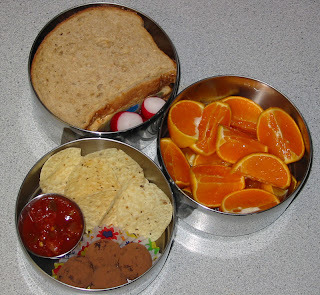 Although I dearly love the kid-friendly Laptop Lunch System I use for shmoo, I still like to keep my eye out for larger, plastic-free lunch boxes that fit us big people and our big, plant-based appetites. 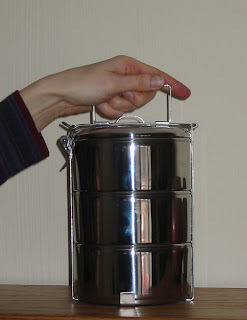 Yes, sometimes even my To Go Ware doesn't hold enough salad to satisfy my veggie-lovin' tummy. It's time to Super Size It! For its maiden voyage I packed my new food carrier with a hearty lunch for two for shmoo and his Dad, who took off together on a day-long Field Trip of Science. Two white bean hummus and grated carrot sandwiches are packed in the first tier alongside a few radishes. I jammed as many fresh tangerine segments as I could into the second container (shmoo has been known to eat that many all by himself, so I hope he remembers to share!) In the bottom tier are tortilla chips and salsa and a few "seedy fudge balls" made from ground sesame, sunflower, and flax seeds mashed together with tahini, cashew butter, dates, raisins, and a splash of tangerine juice. I rolled them in cocoa so they look like little truffles. Verdict: Shmoo is quite taken with these stainless steel containers, and is getting old enough to take them apart and put them together by himself. But is he old enough to carry one to school without swinging and denting it, and possibly someone's head in the process? I don't think so. He's sticking with the plastic lunch box. Shmoo enjoyed the fruit and the fudge balls and ate all but the crusts of his sandwich. My husband took one small bite of his sandwich and ate all the chips and salsa. Guess who's the picky eater in this family? 4 stars. After seeing my recent pea-filled St. Patty's Sandwich, Vegan Lunch Box reader Roxy shared this tip: "I like to blend peas into guacamole--it adds more nutrition to the already nutritious dip and you really can't tell the peas are in there. I use about 1/4 cup of peas to every large avocado. Yum!" Thanks, Roxy, I love it! In fact, it inspired me to make a post especially for sharing these kinds of ideas. Sometimes it seems like the only way you can get children to eat vegetables is to slip a bit in quietly here and there. 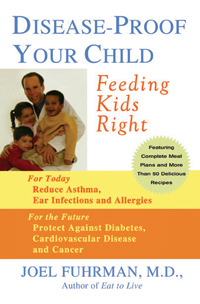 Kids might also be resistant to eating beans, or nuts, or ground flaxseed, or their daily vitamin. What is a parent to do? As those of you who have read my book will know, I love getting sneaky! 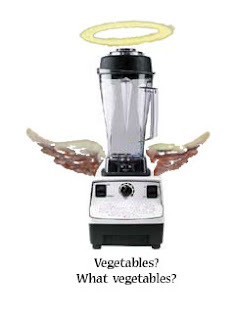 And when it comes to getting healthy foods into reluctant kids, I think a Vita-Mix is a Sneaky Momma's Best Friend. I use mine almost every day to blend vegetables into creamy soups, cooked kale into pizza sauce, even spinach into breakfast smoothies! Of course, I don't actually lie about what is in my blended concoctions, but even when I tell my son that his favorite black bean soup is filled with onions, zucchini, and peppers, he tends to shrug and keep on eating. I guess it's "out of sight, out of mind", and what he can't see can't gross him out. What other tips do you have for us desperate Sneaky Mommas (and Poppas)? Please share! And don't worry -- your secrets are safe with us. Shmoo Review: Benji Bean Sprout Doesn't Eat Meat! Reviewed by special guest blogger Shmoo. 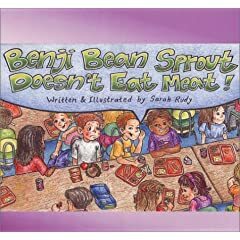 "Benji Bean Sprout Doesn't Eat Meat! is a kind of neat book. It's about a kid who eats vegetarian and other kids think he's weird because he doesn't eat meat. He eats vegetarian meat. The kids who make fun of him are mean but then they try his food and then they don't think he's so weird anymore. He goes to an animal sanctuary. I want to go to an animal sanctuary some day. I want to see a tiger. "Vegetarian kids will like this book, or meat eating kids so they can learn about what happens in factory farms and what happens to the animals. Maybe they would lose their appetite for meat, or maybe they would be nicer to vegetarians. "I have different lunches like this kid. Sometimes other kids wonder what I have for lunches. What was funny was one time this other kid said he liked the smell of my lunch. I like my lunches, too!" St. Patrick's Day (coming up on March 17th) is quite the event in the McCann household, with lots of wearin' and eatin' o' the green. Well, we eat green every day, but on St. Pat's lots of things start turning green! 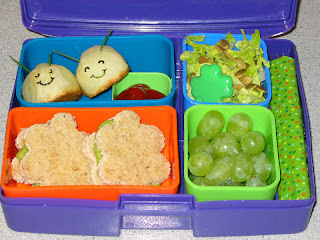 Case in point: these St. Patty's Peanut Butter sandwiches from Disease-Proof Your Child. Cooked peas are blended with peanut butter to make a stunning green spread. I added some agave syrup to make it a bit sweeter for shmoo. Other green goodies include grapes, romaine lettuce with pumpkin seeds and a little shamrock squirt bottle filled with raspberry-balsamic vinegar. And what would St. Patrick's Day be without potatoes? Here are two Potato Beetles from Vegan Lunch Box, packed with a container of ketchup. Chive antennae and nori smiles make these two very happy beetles. Verdict: The potatoes were a huge hit, with demands for many more "potato 'polies" (he says he thinks they look like "rolypoly" bugs now) for snacks later. He left most of the salad but finished everything else. 4 leaf clovers. Happy St. Patrick's Day! A Vegan Lunch Box reader named Melissa emailed me a few months ago suggesting that this recipe for pupusas would make a tasty vegan lunch. Pupusas are traditional El Salvadorian corn masa "cakes" filled with meat, cheese, or beans that are patted flat and fried. 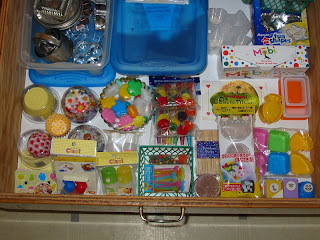 They are often sold by street vendors in El Salvador and Honduras. My lumpy little pupusas are filled with refried black beans and cilantro. I must admit I have not yet achieved Masa Mastery; my dough kept tearing and sticking, leaving bits of refried bean poking out as I tried to round the dough balls and pat them flat. Eventually I came out with a few decent-looking pupusas, but even the really ugly ones still tasted good. I packed them with a small container of salsa. Melissa serves her pupusas with a simple pickled radish slaw, so I followed her lead. This slaw is filled with green and purple cabbage, radishes, vinegar, and cilantro (I'm on a real slaw kick lately, now that I know I like it). 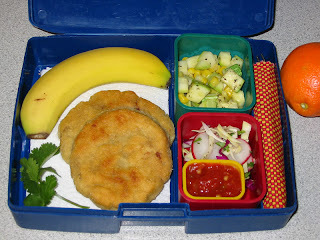 I also made my recipe for Calabacita con Elote (Mexican zucchini and corn) from Vegan Lunch Box. As I revisit some of my recipes with the nutritional knowledge I now have, I'm finding ways to make them healthier. In this case, I steam-fried the veggies with a bit of water instead of oil, then stirred in the marjoram with a tablespoon of Late Harvest Riesling Vinegar instead of apple cider vinegar, sugar and salt. We actually preferred the lighter taste of the white grape vinegar over the original recipe. Verdict: Sadly, this wasn't one of shmoo's favorites, although I thought it made a nice-looking, healthy, well-balanced lunch. He liked the fruit and pupusas and ate them all, but just picked some of the radishes and corn out of the veggie dishes. 3 stars. Thanks so much, Melissa, for introducing us to pupusas!